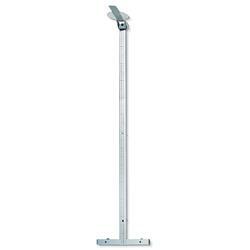 Specially developed for wall mounting, this measuring rod is aligned to work exactly to the millimeter from head to toe. Its broad measuring slide and heel positioner are professional prerequisites. The telescopic measuring rod ensures that the result can be easily read at eye level even for the tallest patient. When not in use, the measuring slide can be folded down for safety.